Lexi Cota’s tutor, Sara English, coaxes her to repeat an “mmm” sound for a spoon of frosting. The Winston-Salem Journal has done some excellent work on autism with this article and video Living With Autism. The article, interactive graphic and video do an excellent job of presenting the realities of life for an autitsic child and her family. It is done with a positive, but realistic, presentation of the challenges facing autistic children. And it cuts to the chase in telling parents of autistic children what they need to know. ABA based early intervention is critically important for your child’s future. These pieces also present very well the challenges faced by parents in trying to educate their children including the inadequacies of the formal education system in helping educate autistic children. “The Gordons suspected that Ross had autism when he was 6 months old, said Kristi Gordon, his mother. He never responded to people or toys, and could spend hours spinning things. The diagnosis was confirmed a year later. “No matter how much we thought it, it still kind of crushed us,” she said. Others, like the Cotas, watch their seemingly typical child change into someone they don’t recognize. When she was a year old, Lexi was a charming, typical toddler, one who loved to pop out from behind doorways and say “hi!” Then, when she was about 16 months old, she began to change. She became at turns silent and withdrawn or unruly, running around and flapping her arms wildly. She was diagnosed with autism a few weeks before her third birthday. No matter when they get the diagnosis, the message that goes with it is the same: Get help now. Many experts say that children who are placed into therapy as soon as possible have the best chance of eventually living a relatively independent life in which they will be able to have a job, even if their social mannerisms are unconventional. “When you see them young, and 11/2, 2 and 3, you have no way of knowing which child will respond well to intervention and which won’t. The idea is you provide intervention and treatment when they’re young,” said Dr. Kurt Klinepeter, an associate professor of pediatrics at Wake Forest University Baptist Medical Center and the medical director of Amos Cottage. Amos Cottage is affiliated with Wake Forest and offers services for children with developmental problems. It’s difficult to tell how many children have other conditions that co-exist with the autism. About 30 percent of autistic children will have IQ scores in the normal range. Those children will have the best chance at eventually living independently, with jobs and typical lives – not just because they score well, but also because they have to be on the higher-functioning end of the autism spectrum to be able to take an IQ test at all, Klinepeter said. The other 70 percent aren’t necessarily mentally retarded, he said. They could be more affected by the communication and social aspects of the disorder, which would make it nearly impossible to correctly administer an IQ test. Children who are suspected of having autism usually end up at the county’s early-intervention program, either through a referral from a doctor or day-care worker, or because the parent is concerned enough to want an evaluation. If the child is autistic, the county is in charge of providing therapy until the child turns 3, through the Children’s Development Service Agencies. Children can receive a combination of speech, occupational and physical therapies. Some also receive therapy through the ABC of NC center. It is paid for by Children’s Development Service Agencies. Many parents want their children to receive Applied Behavior Analysis. The National Institute of Mental Health, the leading federal agency for research on mental and behavioral disorders, said that ABA has “become widely accepted as an effective treatment” in its booklet about autism. ABA is the only treatment specifically mentioned in the booklet. To parents of newly diagnosed autistic children I say over and over again – do NOT listen to the sometimes irrational voices that tell you to accept and embrace your child’s autism. Autism is by definition a disorder, a condition which brings with it many deficits in thought, communication, and behavior. True there are some savants and there are many high functioning autistic persons who have social deficits and some communication limitations. But there are also many lower functioning autistic persons for whom the reality IS life in residential or institutional care. It can be a life threatening and dangerous condition. Love your child as he or she is, complete with his or her autism. But do not mistake your child for his or her autism. Fight to improve your child’s lot in life no matter how many hand wringing, joy of autism advocates tell you that you are suppressing and rejecting your child. They will not be there to help your child when he bites himself repeatedly, when she wanders out the front door only to be found hours later, or when you are sick, elderly, infirm or deceased. They are interested in their agenda not in your child. The most important way to help improve your child’s abilities is to get as much behavioral intervention as intensively and as early as you can. ABA based intensive intervention meets the evidence based standards of federal, state, provincial, professional and academic autism organizations across Canada and the United States. To date it is the ONLY intervention that meets those high standards. “Autism is a complex neurobiological disorder that typically lasts throughout a person’s lifetime. It is part of a group of disorders known as Autism Spectrum Disorders (ASD). It occurs in all racial, ethnic, and social groups and is four times more likely to strike boys than girls. 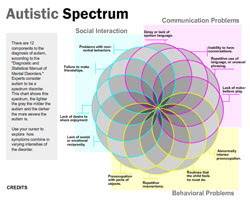 Autism impairs a person’s ability to communicate and relate to others. It is also associated with rigid routines and repetitive behaviors, such as obsessively arranging objects or following very specific routines. Symptoms can range from very mild to quite severe. Autism Spectrum Disorders can usually be reliably diagnosed by age 3. Parents are usually the first to notice unusual behaviors in their child or their child’s failure to reach appropriate developmental milestones. Some parents describe a child that seemed different from birth, while others describe a child who was developing normally and then lost skills. Pediatricians may initially dismiss signs of autism, thinking a child will “catch up,” and may advise parents to “wait and see.” New research shows that when parents suspect something is wrong with their child, they are usually correct. If you have concerns about your child’s development, don’t wait: speak to your pediatrician about getting your child screened for autism. For further information about autism, please go to http://www.autismspeaks.org. Also, on their Website is a very informative 13-minute segment entitled, “Autism Every Day.” It gives an accurate portrayal of what life is like for an individual with autism, as well as how it affects the family. When Aubrey was born in 1992, she looked and acted like all other babies. But as she grew older, she began walking on her tiptoes, she pitched tantrums and she screamed when her hands got dirty. She did not want to play with other children, and she was terrified of swings and teeter-totters. Yet, Aubrey was intelligent and often appeared normal in unfamiliar situations. In a book released Jan. 15 targeted to parents of children with behavior problems, Clarke discusses ways to seek a diagnosis for various disorders in children, and she explains how to keep hope alive and not to give up in dealing with situations no one seems to understand. It was not until Aubrey was 3 years old that an early intervention team from the Linn-Benton-Lincoln ESD used the word autism to describe Aubrey’s behavior. Since then, through counseling, therapy and family encouragement, Aubrey has left many of her symptoms behind. Aubrey is now 14 and a freshman in high school. She has entered talent shows, been part of a singing group and a dance team. She tutors elementary students at a Boys & Girls Club, and she wants to go to college and eventually have a family. “I can’t imagine the consequences if I hadn’t kept on pushing,” Clarke said. 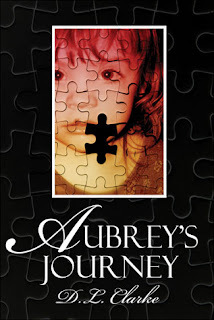 Signed copies can be ordered through her Web site: aubreysjourney.com.